It’s no secret to my gaming group that I’m getting burned out playing Dungeons & Dragons. I’ve wanted to try something new for years now, but as D&D 3.5’s variant rules (and even core rules) have proliferated with its end-of-edition publishing spasms, my desire to try something different has intensified. The Battlestar Galactica RPG was one one of those different things. Cover art for the Battlestar Galactica RPG. Credit: Margaret Weis Games. 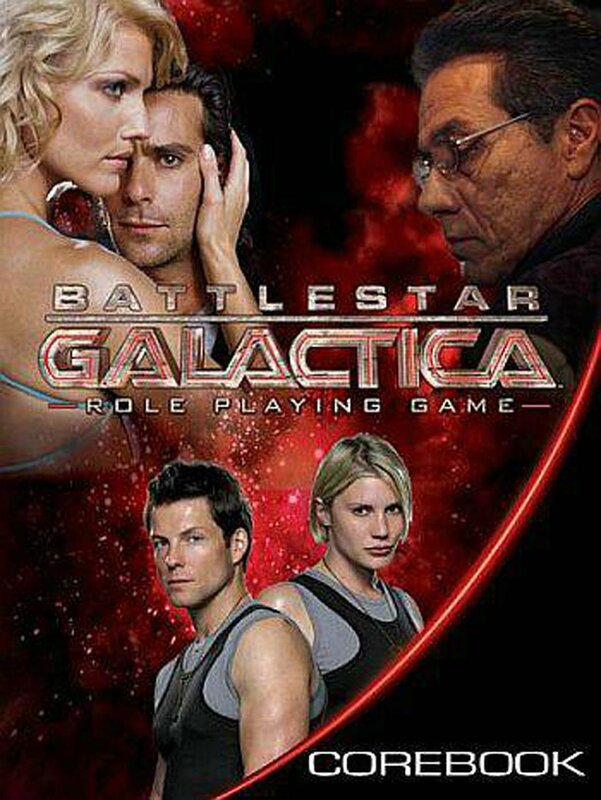 The Battlestar Galactica Role-Playing Game is based on the SCI-FI Channel’s re-imagined version of the 1970s space opera. The role-playing game’s opening chapters chronicle the founding of the Twelve Colonies by the Tribes of Kobol after some terrible cataclysm destroys their home world. Each of the twelve colonies is located on a moon or planet in the same solar system. Summaries and role-playing notes for the inhabitants of each world are given, and a map of the solar system provides a much-needed overview of how these systems interrelate. The book chronicles the First Cylon War, in which humanity’s robotic minions rose up, rebelled and were exiled into deep space, and then details the events of the Second Cylon War, in which the machines return to launch a genocidal assault on their creators. The book covers the events depicted in the initial Battlestar Galactica mini series as well as the first half of Season One. The game’s rules are detailed in the middle four chapters, and make use of a tweaked version of the Cortex rules that debuted with the Serenity Role-Playing Game. Characters are defined by three characteristics: Attributes (base statistics like Strength and Intelligence), Skills (learned abilities like Piloting or Computers) and Traits (advantages or hindrances provide role-playing hooks and in-game bonuses/penalties). Each characteristic is rating on a dice-based scale that runs from d2 (a two-sided die) to d12 (a twelve-sided one). Tasks in the game, be it shooting a Cylon or negotiating with a black market dealer, are resolved by combining an Attribute and a Skill (such as Agility and Guns for firing at the aforementioned Cylon), rolling and then comparing the result to a target number (the “action difficulty”. An easy task is a 3; a hard task is an 11, and an impossible one is a 31. Beating any of these action difficulties by seven scores an extraordinary success, meaning the task is done exceptionally well (which can have varying in-game effects). Advantages and Hindrances may also factor into the roll – an impassioned plea for help might be bolstered by the inspired leadership of a character with the “So Say We All” advantage, while a cocky Viper pilot might find the difficulty of a dogfight maneuver increased because of his “Overconfidence” hindrance – he just can’t resist showboating, even in the face of danger. Characters have two kinds of health, Wounds and Stun. Wounds are damage taken by lethal weapons, such as guns, while Stun is dealt by non-lethal blows and some environmental effects. Combat works similarly to Skill checks, except the difference between the target number (the opposing individual’s Defense) and the amount rolled as a success is used as initial damage. This damage is divided between wounds and stun. Then the weapon’s actual damage is rolled, which is almost always wounds. When the two kinds of damage meet – e.g. a character with 22 hit points take 12 wounds and ten stun – the character goes unconscious … or worse. This system is more realistic then other systems – it’s not just measuring whether you hit, but how well you hit – but it’s also far more lethal. Plot Points are the game’s creative currency. Each player starts with six points, and can spend them to improve die rolls and soak damage. Players can spend plot points to buy additional dice – from a d4 up to a d12 – to augment their die rolls. This allows them to pull off those near-impossible shots like putting a bullet into the visor of a Centurion or landing an out -of-control Viper. They can also be spent to avoid damage, turning aside or lessening a killing shot. Players can also spend Plot Points in an attempt to hack the plot of the game session: they pitch a story edit and tell the GM how many plot points they think the change is worth. The game master can then except or reject the edit. Some edits are minor – like a character suddenly remembering an extra clip of ammo – while others might be more significant, like stumbling across a supply of fresh water just when the fleet needs it most. Points are earned for good role-playing and entertaining table play, and are designed to be awarded and spent quickly; in a perfect game, plot points are regularly flying around the table. After the core rules, which also detail equipment, vehicles and environmental conditions, is a Game Master section with advice for running a Battlestar Galactica campaign. It has suggestions on different kinds of campaigns: political and military within the Galactica fleet, alternative history campaigns with the player characters taking the role of the original main characters, guerilla campaigns set on one of the Cylon-occupied worlds. Lucius “Lucifer” Calloway loves to burn. Whether its blowing Cylon raiders from the sky or torching his bridges with command officers, he lives for the flames and the explosions that accompany him. He’s also one hell of a pilot, so no matter how badly he screws up, there’s always been a job waiting for him somewhere. In game terms, Lucifer’s got the assets Dogfighter (d4) and Lady Luck (d4). He’s also got the hindrances Overconfident (d4) and Rebellious (d4). In other games, it’d be easy for a min/maxer to play down the negatives while always calling into the positives, adding in his extra d4 when he’s making combat checks, or using his “Lady Luck” ability – which grants him a chance to re-roll one check a day. If the GM isn’t forcing the player to confront his hindrances regularly, the player could easily coast. Not so in Battlestar. In this game, players want to bring their hinderances into play because they drive the drama that will win them the Action Points they’ll need to hack the plot or survive a point-blank shot from a Cylon. Suddenly a player who might have been content to sit back and watch the game go by is compelled into the action. In the case of a character like Lucifier, the player starts looking for commanding officers to pick a fight with, and impossible missions to test his steel against. It’s a hell of a change. I’ve played other games with Plot Point-like mechanics, namely Dungeons & Dragon’s “Action Points”, Savage World’s “Bennies” and Spycraft’s “Action Dice”, Mutants & Masterminds “hero points” None were as successful a promoting role-playing as Battlestar Galactica’s Cortex system, and I think that’s because Margaret Weiss Productions succeeded in making the dice – particularly securing the dice — an integral part of the system. Like the series that spawned it, the RPG is about taking big chances at exactly the right moment. Reading through this book, I could see in an instant why these rules originated with Serenity – that series has a similar vibe of ordinary people digging deep to do amazing things. While Plot Points were a high point, combat could be problematic. The game’s fuzzy on how many actions a character should take a turn, and while it suggests the max is three, that’s usually too many. The reason for that is simple: combat is exceedingly deadly in this game, and if the enemy is getting three actions, particularly three shooting actions, their opponents are going to be dead no matter how many Plot Points they spend to try and soak the damage. In this, it’s very loyal to the show – no one stands up to a Cylon Centurion and lives; almost every combat you see with them is a run-and-gun maneuver, or a pitched fight from heavy cover. That works well on the TV screen, but not so great at the table top where no one wants their character to get wiped out before they’ve even had a chance to go. I don’t think this is necessarily a flaw in the game, but the lethality of combat is something that game masters have to be hyper aware of so that they can avoid putting their players in situation where instant death is a possibility. It’s also something that players need to understand; those who play D&D, and who are used to slugging off a blow from a dragon, will be shocked when their character can’t stand up to a Centurion. More examples of how combat works, and in particular, how many actions different tasks take, would have been helpful. For example — is drawing and throwing a grenade one action or two? Sniper-rifles are bolt action; is that an action to reload after firing, even with a clip? In hindsight, the answer to both of these is “yes, two actions” but it would have been helpful if the rules spelled things out. Savage Worlds, also a rules light system, was able to do this without bulking up the rulebook. At first glance, Battlestar Galactica might seem like a difficult setting in which to run a role-playing game. The story focuses on a dozen or so key characters, and the epic story of the quest for Earth is not one that most fans would want to change. Playing as the main characters feels strange; playing as second-stringers could seem hollow in comparison. Yet, as I sat down to write my playtest, with the Battlestar Galactica mini-series playing in the background, I started to think of just how wide open a BSG campaign could be. Yes, the quest for Earth, and the main story is tightly scripted, but it’s a big fleet. There’s plenty of opportunity for political and social intrigue among the ships of that fleet and there’s enough wiggle room about Galactica to fit in a couple of new pilots, techs, officers or Marines. And who says you need to follow the Galactica? As the series itself showed, there are still stories to be told on the Cylon-occupied Twelve Colonies. The tale of human freedom fighters waging war against the metal invaders could power a campaign for months. There are pre-invasion possibilities as well – the folks at the Cortex System fan site have already posited a Galactica/Firefly mash-up. It makes sense: just as in Firefly, the Twelve Colonies are all located in the same solar system (a fact I didn’t realize until I got the book). And the religious, political and economic conflicts that show up in Battlestar carry certain echoes of Joss Whedon’s space western, not to mention that a Firefly-class ship showed up in the BSG mini-series thank to the special effects crew (who also worked on Firefly). For my part, I settled on telling the story of a different rag tag fleet; one led by the Cerberus, a Hellion-class heavy cruiser that pre-dated the battlestars. It managed to survive the Cylon attack, gather together a small force of ships, and head out on its own stellar quest. Rather than trying to find Earth, the Cerberus was looking for the son of one of the Lords of Kobol who’d been banished during the migration for being to war-like; you can read about the playtest of the scenario in my “Flight of the Cerberus” game day column on Nuketown. The Battlestar Galactica RPG is a dynamic, fast-moving game that stresses role-playing and gives both players and game masters everything they need to recreate the television series. It may be a bit rough around the edges and it can be extremely deadly, but its still a hell of a lot of fun. More importantly, it succeeded in igniting my imagination, and got me excited about running a BSG game. Indeed, my only regret is that I’ll likely never be able to finish my Flight of the Cerberus miniseries.